I ran across this photograph of young women practicing semaphore signaling in a random search of the IWM's collections database. The two Girl Guides (whose scouting organization had been founded in 1910 by Robert Baden-Powell) seem quite serious about their enterprise, and for good reason. Semaphore signaling was an important method of communication. A simple way of transmitting information at a distance, it originated in the late eighteenth century and came to have many uses. For instance, railroads were known to use semaphore signaling to control train traffic and ensure safety. The essential component of the system is the use of movable arms (above demonstrated quite literally) to hoist signal flags. According to a 1918 encyclopedia entry on signaling, the British Navy used a system of seven positions. An entire alphabet could be signaled depending on the positioning of the flags. The system is still used today, though much more rarely than it once was. Semaphore Alphabet, from Capt. E.J. Solano's book, Signalling, 1918. Women young and older clearly took an interest in semaphore signaling on the Great War homefront, as the two fascinating photos from the IWM's collection show us. Signaling officers on the battlefields, like the young man who once owned the set of instructional cards below, used semaphore signals to communicate important information during combat. A British Pathe film from the war era shows multiple women demonstrating semaphore flag signaling at an unknown location. Such evidence suggests that women's war efforts included the learning of the semaphore system as a way of mobilizing the homefront, of being prepared for emergency communications, should other, more technologically dependent, methods become unavailable. "Decoding the Logo," BBC News Magazine. The artifacts we have here show us that semaphore signals were an essential part of information transmission on the battlefield and a part of women's homefront service during the Great War. The semaphore system, with its instructional silhouetted figures gripping flags or photographs of eager young people practicing with arms held aloft, is one example of communication, already heavily electronically mediated by the time of the war, remaining human--conveying important military messages, homefront anxieties, and, eventually, hopes for a more peaceful world. I once had a conversation with an advisor about the possibility of contracting academic shellshock from researching and writing about war literature. I believe we agreed that it was indeed possible. Truly, it isn't always easy engaging so deeply with the grim and arduous topic of war and its literary expressions. But no grad student would describe any dissertation as a walk in the park. Thus, how much of my occasional academic malaise has to do with war and how much to do with the mere process of writing a dissertation remains a mystery as yet unsolved. A surprisingly effective remedy came my way this evening, though, from none other than the wonderful Dr. Dolittle. Yes, that Dr. Dolittle, the protagonist of Hugh Lofting's endearing series of children's books, the first of which was published in 1920. Varges Ariel. British Officer of the Army Veterinary Corps in Salonika with his Pets, 1916. © IWM, Item Q 32252. The British veterinary officer with his jackdaws, goose, dog, and wolf cub seems a veritable Dr. Dolittle, friend to and communicant with all creatures great and small. The photograph made me go hunting for information about the books, which I first encountered in a school library as a child of about eleven. “'Lord save us!' cried the duck. 'How does it make up its mind? '” The Story of Dr. Dolittle. To my surprise, I found that Dr. Dolittle is in fact a ghost of 1914. 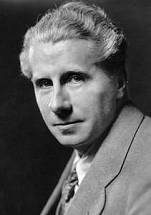 His creator, English-born, MIT-educated, civil engineer Hugh Lofting (1886-1947), served with the Irish Guards in the First World War. When writing home to his children, Lofting chose to protect them from the gruesome details of trench warfare. Instead, his letters featured the beginnings of the Dr. Dolittle stories. It is amazing to think of the way this fictional character allowed Lofting to create a bit of innocence amid the strife of the battlefield. --The Story of Dr. Dolittle, p. 3. (A disgruntled patient leaves after sitting on a hedgehog) The Story of Dr. Dolittle. Lofting was wounded in the war and eventually moved to Connecticut (my erstwhile home) with his family. In his lifetime, he would write and illustrate twelve books about the eccentric Doctor, who hails from a town called Puddleby-on-the-Marsh and learns to talk with and heal animals and undertakes many amazing adventures with them around the world and beyond. Dr. Dolittle enjoyed several incarnations on the stage and screen and continues to be a beloved hero of fiction. There are many fantastic web resources on Dr. Dolittle, including full-text (with illustrations!) books on Gutenberg and Google Books. Karen Welbourn's Puddleby-on-the-Marsh website has a treasure trove of information and materials related to Lofting and Dr. Dolittle. I hope you have enjoyed this lighthearted little jaunt with Dr. Dolittle and me. This merry ghost of 1914 certainly brightened a grad student's day of slogging through the dissertation trenches. Though the Somaliland Camel Corps bears its own fascinating history, we are here today to explore the Imperial Camel Corps, founded specifically for service in the Middle East during the First World War. Pro-Turkish tribespeople began to revolt in Egypt in 1916, and the Corps (known as the ICC) was organized to quell this rebellion, according to the Australian War Memorial's excellent web page on the ICC. ICC troops were enlisted primarily from Australia, New Zealand, and Britain, with Indian soldiers later joining their ranks. With the shift from patrol to combat in Egypt, the ICC was reorganized into the Imperial Camel Corps Brigade by the close of 1916. Four battalions within the brigade were established by 1917, and with the addition of the Hong Kong and Singapore Mountain Battery, as well as a machine gun squadron, Field Ambulances and medical support for soldiers and camels, and a Royal Engineer Troop, among other supports, the ICC Brigade became a formidable military force. For those who want to know more, New Zealand History Online has a great article on the organization of the ICC. Hong Kong and Singapore Mountain Battery troops training. Australian War Memorial, Item B01465. Australian Camel Company, ca 1914-18. Camels were considered an ideal service animal for the Middle Eastern front, as they were naturally adapted for the terrain and climate. The camels who served in the ICC were initially brought in from the north Indian district of Bikaner. This princely state had its own camel-mounted unit, known as the Bikaner Camel Corps, whose Imperial Service Troops also fought for the British Army in Egypt. Bikaner Camel Corps in Egypt, ca 1914-18. Camels are sturdy animals, and both the Indian and the Egyptian camels who also served in the Corps were able to carry soldiers and their equipment at an impressive clip in the desert sands. They also managed to remain calmer in combat situations than their equine counterparts. Typically, camels would transport men, sometimes known as cameliers or cameleers, and goods, with troops dismounting to engage in artillery combat. The Australian War Memorial's collection database has an extraordinary assortment of objects and media representing life in the ICC. The ICC Brigade served gallantly in Egypt and Palestine through to Armistice. Combat in Palestine began to necessitate transition for Australian and New Zealand troops of the ICC, who were moved into horse-mounted battalions. Notably, near the end of the war, two of the British battalions who had remained in the Brigade played an important role in the Arab Revolt, alongside T.E. Lawrence ("Lawrence of Arabia"). By the time of the ICC's complete disbanding in May, 1919, nearly two hundred fifty casualties had been sustained among its British, New Zealander, Australian, and Indian members. 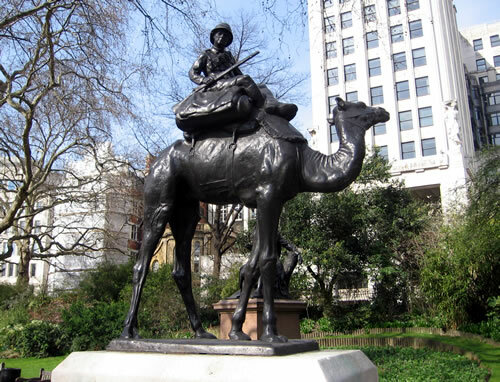 A memorial to the Imperial Camel Corps was installed at Victoria Gardens, London, in 1921. The mounted soldier and his camel are startling and somewhat poignantly situated in the verdant park, especially against the backdrop of modern skyscrapers as shown above. They seem to pause amid a long and arduous journey from a world far away, reminding us that the ghosts of 1914 hail from many reaches of the globe and represent a much stranger, more curious, set of histories than we may initially assume.